I have some leftover salmon skin from making salmon sushi. Usually I fried the salmon skin to make roll/maki (most Japanese restaurant do that) ,but this time I just fried and add with stir -fry Shanghai bak choy..It's really taste good and smell fantastic !! I would love to share this simple recipe here with you!! Stir-fry Shanghai Bak Choy with Salmon Skin ..
1:Heat wok or skillet with oil at high heat.When the skillet hot enough,lay salmon skin on it,fry both side until golden brown and crispy.Remove from skillet and cut small,set aside. 2:Use the same skillet or wok ,add in oil and garlic,fry until fragrant,then quick add in Shanghai bak choy ,oyster sauce and chicken bouillon.Give a quick toss few times at high heat,not more than 2 minutes. 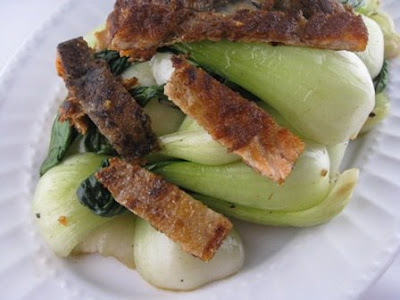 3:Add in fried cut salmon skin with cooked Shanghai bak choy,dish out and serve warm.